Today we are blowing out the cobwebs and looking back to 2010 when we made the most highly loaded tube in CST history. Transitioning the 95,000 kg working loads into the laminate made it an extremely complex tube to engineer as well as manufacture. We had to ensure that the safety factors were sufficient which resulted in the laminate thickness in some areas exceeding 75mm. Many new production processes were developed for this project, ranging from thick laminate curing to incorporating the metal threaded ends during the winding. This was a great milestone in CST history. It’s been 10 years since CST composites released the one piece M351. This mast was a revolution at the time, cutting the mast diameter from 50mm to 40mm. The Moth Worlds 2008 were won by Australian John Harris at ‘Windy’ Weymouth in July 2008. The class has come a long way since then and we at CST are stoked to support the class and excited to celebrate the recent 8th victory with CST spars. Below is a breakdown of CST’s victories over the last ten years. Deck Sweeper DS1 Mast: Used by Paul Goodison to win the 2018 worlds and is targeted at the top end of the fleet. Deck Sweeper DS4 Mast: This mast is a little stiffer and easier to sail downwind and will help the good sailor become better. Tapered Bent Boom: Also used by Paul Goodison to win the 2018 worlds. The Elite range of masts is still available and suitable for conventional sails which are still fast and current. The most popular being the Elite 21, Elite 22 and Elite 24. VRsport.tv caught up with Chris Dixon and Clynton Wade-Lehman, from Sydney based CST Composites, who popped over from Australia to showcase their carbon spars to the UK sailing community. Click here to watch the video. Clynton and Chris from CST Composites will be at the RYA Dinghy Show at Alexander palace in London both days (3 & 4 March). If you would like to meet to discuss potential or current projects contact Clynton. It would be great to see you. Clynton and Chris from CST Composites will be attending JEC World in Paris on 6 and 7 March. Please email Chris if you would like to meet. The new CST Moth Carbon Gooseneck will soon be available. We have collaborated with CST Team sailors to develop this high performance component. Nathan Outteridge wins the 2018 CST Composites Moth Nationals at Wangi. 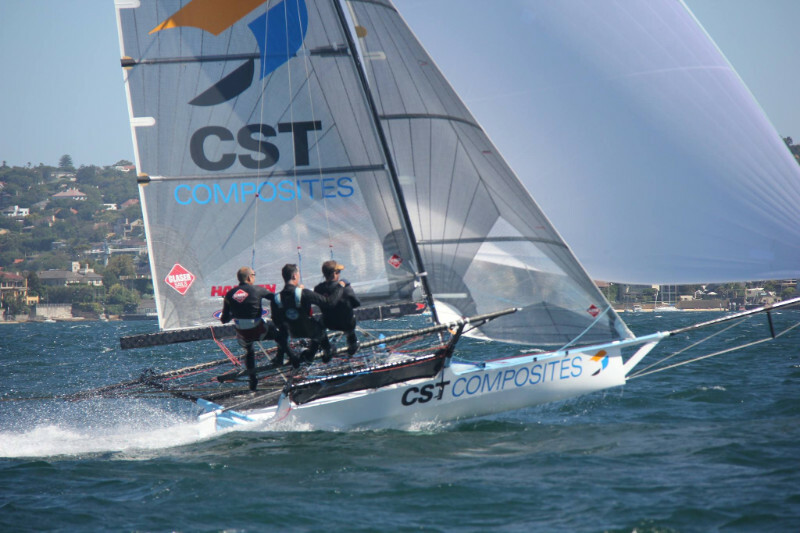 CST Team sailor Nathan Outteridge wins the 2018 CST Composites Moth Nationals at Wangi. CST team sailor Mark Bulka has won the Contender World Titles for another year. Mark was using the new CST rectangular boom and standard mast.